Wendy Greuel has joined CSUN as executive-inresidence in the David Nazarian College of Business and Economics. Among her first events was the 50th anniversary gala for the college. 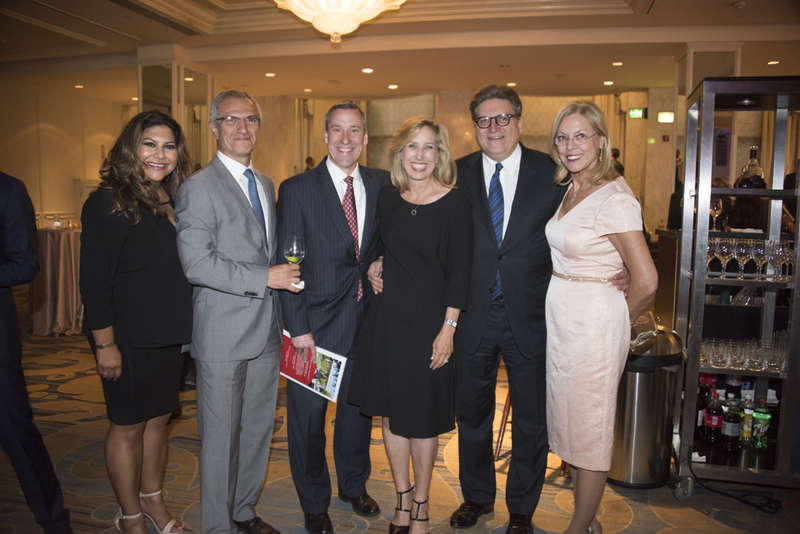 From left, Francesca Vega, director of government and community relations for CSUN; Afshin Kateb, CFO at Nimes Capital, LLC; Robert Gunsalus, CSUN’s vice president for university advancement; Greuel; Calif. State Senator Robert Hertzberg and CSUN President Dianne F. Harrison at the gala. Photo by Lee Choo. Former Los Angeles City Controller Wendy Greuel has spent her life giving back to the community — whether serving on the staffs of the mayor of Los Angeles and the President of the United States or as an elected official herself. She hopes to tap into that experience in her newest role as executive-in-residence in California State University, Northridge’s David Nazarian College of Business and Economics. Greuel began her new job in September. “I grew up in the San Fernando Valley and have watched Cal State Northridge as it’s grown into the wonderful university that it is today,” Greuel said. “This is my chance to give back to the university that I think has been the foundation for what the San Fernando Valley is today, and has helped shape Los Angeles as a whole. Kenneth R. Lord, dean of the Nazarian College, said Greuel’s experience in the public sector and familiarity with Los Angeles politics and the city’s governmental institutions make her a valuable addition to the university and the college. Greuel was born and raised in the San Fernando Valley. After graduating from UCLA, she immediately joined the staff of then-Los Angeles Mayor Tom Bradley. She later served in President Bill Clinton’s administration as Housing and Urban Development (HUD) Field Operations Officer for Southern California, where she was instrumental in coordinating HUD’s emergency response and recovery programs following the devastating 1994 earthquake. From 1997 to 2002, she worked in corporate affairs for the entertainment company DreamWorks SKG. In 2002, Greuel was elected to the Los Angeles City Council, where she represented the Second District in the northeast San Fernando Valley until her election as city controller in 2009. While on the city council, Greuel served as president pro tempore and pushed for the Valley to get its fair share of resources. She also has advocated measures to reduce financial influence on the political process and to eliminate government fraud and waste. She pointed out that governmental agencies often rely on their local institutions of higher education for help with research and as a talent pool for employees.